Join us for the 49th running of this exciting, summer-ending event. You will experience Mackinac Island in one of the oldest and most scenic races in Michigan. The Island is a unique destination that can only be reached by ferry. Step back in time to a bygone era where travel is done by foot, bicycle, carriage or horse. With almost 2,000 runners and walkers, this is definitely a race you and your family will never forget! Race Photos on Your Results Page! This year we are offering FREE race photos to all of our participants. After the race, view your results and photos taken at the race – all on one page! You will be able to share as many photos as you want for free! 2019 Mackinac Island Trio Series! Register for all three races and you will receive a special Mackinac Island Trio Series medal. This will be a separate medal from the other finisher’s medals you will receive at the completion of all three races, and will only be awarded following the Great Turtle Half Marathon. You can register individually for all three events and be eligible for the Trio and the medal. Special Rates at Mission Point Resort for the Trio Series! Mission Point is holding rooms for all three events at special rates – and if you call to reserve the rooms and tell them you are doing the Trio, you will receive a 10% discount. Rooms for all three races must be reserved at the same time. Call 800-833-7711 to get the 10% Trio discount. The 8 Mile Run & Walk will start directly in front of the Mission Point Resort. 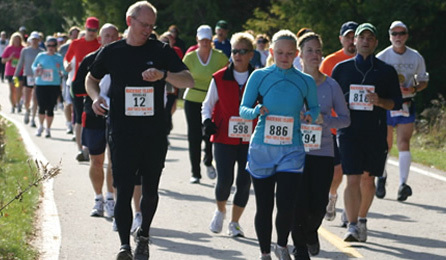 The Finish Line is located along along the Lakeshore Trail on the lakefront lawn (Great Lawn) of Mission Point Resort. Please line up according to your pace with the faster runners at the front and walkers the last to start. Kids Fun Run will begin at approximately 11:45 AM Children should gather at the Gazebo on Mission Point’s Lawn for fun exercise and instructions prior to the race.